Back in December I wrote about gifts to give yourself and the first one was a peaceful heart. What were your thoughts on that? Did you pause and wonder what I was talking about? I’m using the word ‘heart’ for convenience, but I don’t mean the organ that pumps your blood. I mean your emotions or even just the general feeling tone in your body. I’ll use the word ‘heart’ to represent all this. The mind and body are deeply interconnected which means if you’re on a healing journey, it’s useful to develop your awareness of your emotions and how they impact you. In other words, notice how your heart reacts to things like conversations with other people or your own thoughts and memories. For example, if you think of a painful memory, what goes on in your body? Maybe your chest tightens or your belly contracts? Or what if you’re in a conversation with a person who intimidates you? I usually feel like there’s a rock in my belly. Start tracking these sensations. How often does this happen in a normal day? And what about the happy times? When something makes you laugh, do you notice your body? Do puppies, even the thought of puppies, make your heart all warm and fuzzy? How about baby penguins? This is important information even if it seems trivial. The path to a peaceful heart begins with awareness. Researcher Kelly Turner, Ph.D. found that healing suppressed emotions was one of the nine key factors in radical remission of cancer. In fact, only two of the nine factors were actually physical. The rest were emotional and spiritual in nature. You can read about her findings in her book, Radical Remission: Surviving Cancer Against All Odds. Even if you’re not ready to dive into your deepest, darkest memories, you can still pay attention to your heart messages now and start understanding your patterns. You can also cultivate more positive experiences through heart practices like gratitude and lovingkindness. For a gratitude practice, think of something you’re grateful for–it can be big or small. Hold it in your awareness for a moment. Notice if you sense anything in your heart. I tend to experience this as a sense of opening or softening in my chest, but you may experience something else. Above all else, just experience your gratitude. Similarly, with lovingkindness, think of someone you really like, it could even be your pet, and send them kind thoughts like, May you be well and happy. May you be healthy and strong. Use whatever words work for you. Again, notice what you feel in your chest area as you continue to send them these kind thoughts. Then see if you can practice this kindness with everyone you encounter in your day, even the pesky people. You could be grateful that they are helping you to cultivate more patience and kindness. These are steps to a peaceful heart. There are more to consider like compassion and forgiveness, but those can come later. 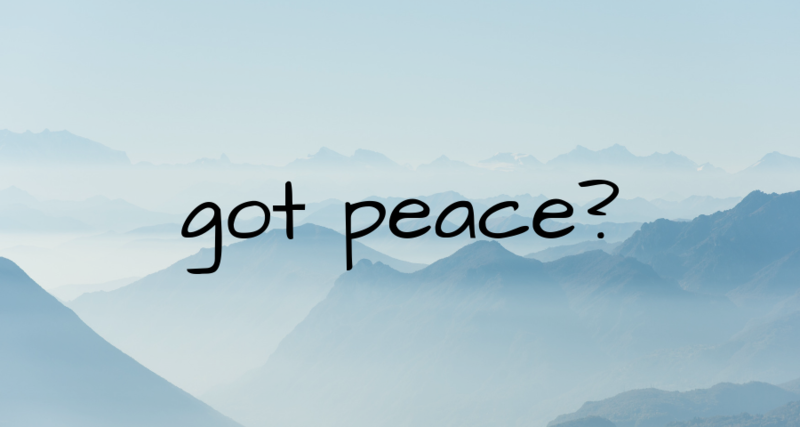 Ultimately aren’t we all looking for peace, happiness and contentment in our lives? And even if we just become 10% happier through our efforts, isn’t that a great accomplishment?